A performance piece entitled 'where will we meet?' 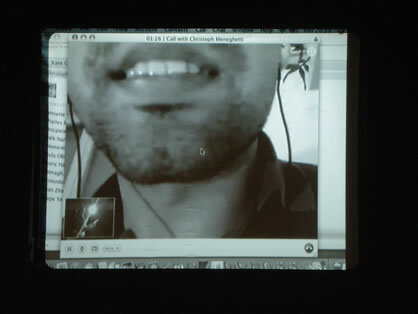 is a physical exploration of meeting in virtual and actual spaces simultaneously in a live event. The piece is performed by two live performers and their virtual doubles who communicate through an improvised language based on gesture. The audience is invited to follow the journey of a gesture as it travels through cyberspace to re-emerge as an instruction, and in doing so, observe the time delay that exists between the performers and the spaces in between. By physically being in the same space, and using technology to connect to one another, we serve to demonstrate the distance that we share. By exploring a physical relationship through technology, we encounter visible differences and time delays in our actions, symptomatic of our individual thoughts coming together as one.